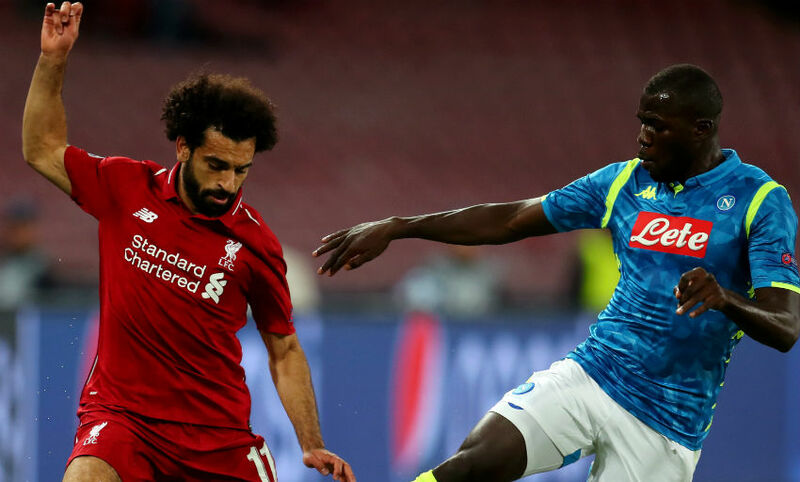 Liverpool were defeated by a 90th-minute winner for Napoli at Stadio San Paolo on Wednesday. Lorenzo Insigne's late goal sealed the three points for the hosts, who move top of Champions League Group C. The Reds sit second by virtue of their head-to-head record against Paris Saint-Germain. It’s all over at the San Paolo, with Liverpool beaten by Insigne’s late, late goal. The warning signs were there for the Reds in the second half, as Gomez had to hack one off the line before Mertens rattled the crossbar. It still looked as if the visitors would get a point that would have kept them top of Group C, but Insigne turned Callejon’s 90th-minute cross home to claim the victory for Napoli. Insigne slides home Callejon's cross at the far post to get what looks like being the winner for Napoli. 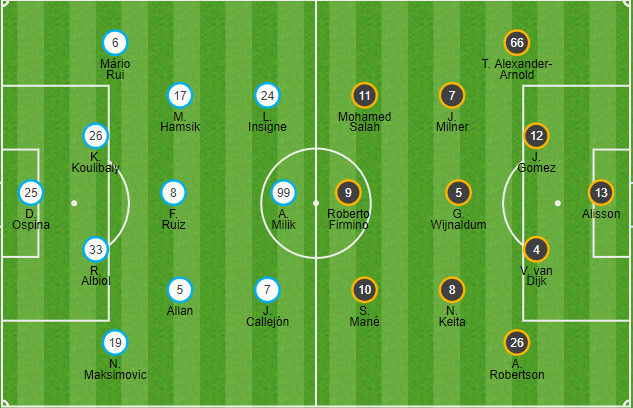 And here's Liverpool's third and final change, as Sturridge replaces Mane. Another late goal a la Stamford Bridge would be nice, Daniel! Salah is a matter of inches away from getting on the end of a throughball by Mane, but Ospina just - and only just - beats him to it. Mertens crashes an effort onto the woodwork from close range. A late let off for the Reds. A second substitution for Liverpool - Fabinho is on for Milner. Good defensive work again from Gomez, who gets back to clear Callejon's drilled, low ball across the face of goal. At the other end, Verdi shoots high and wide after Robertson had hooked Insigne's cross away. Liverpool have regained a foothold in these last few minutes, and a Salah shot from the edge of the box has Ospina scrambling. However, the No.11's attempt goes wide. The pressure from Napoli has subsided a little now, although the home team have had a touch over 63 per cent of the ball so far in this second half. What a challenge by Alexander-Arnold! The full-back gets across to slide in on Milik, just as the forward was about to pull the trigger inside the area. Napoli are on top here. The Reds could do with keeping the ball for a minute or two. The Brazilian parries the forward's shot from range, and Gomez reacts quickest to clear the danger. Fabian Ruiz then tests Alisson with a powerful skimmer from outside the box, which the Reds' stopper gathers. The hosts get us restarted in the Neapolitan drizzle. There goes the whistle to bring the first half to an end. After coming under some early pressure, Liverpool grew into the game and enjoyed the better of the play as the interval approached. 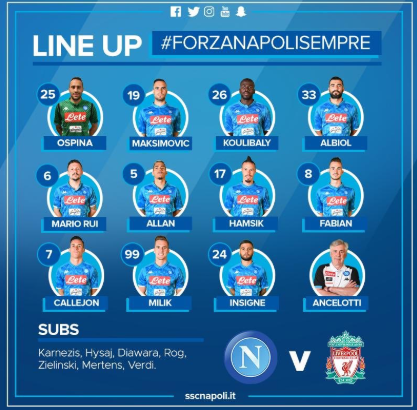 Napoli had the half’s only shot on target, with Alisson saving comfortably from Milik. 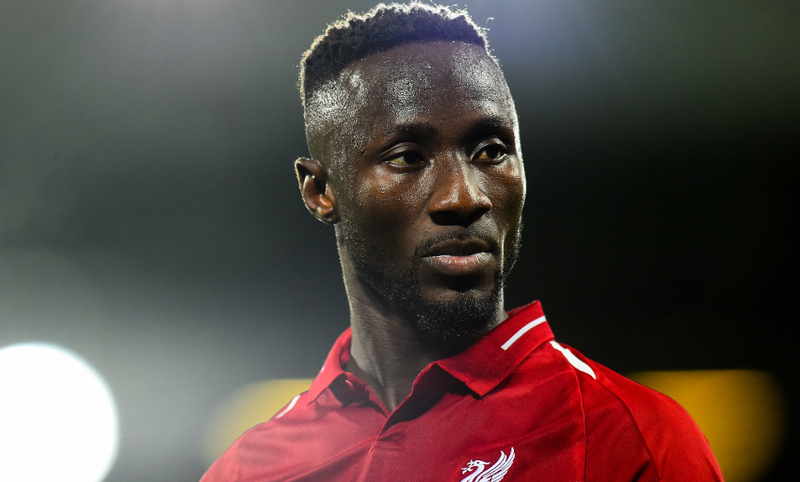 A concern for the Reds comes in the form of an injury to Keita, however. The midfielder had to be replaced by Henderson inside the opening 20 minutes after going down during a break in play. Milner goes into the book for a challenge on Mario Rui. That's better from the Reds. Again, Gomez surges out from the heart of the defence and finds Robertson. Salah then sees a shot blocked, before Alexander-Arnold opts to have a go himself from the loose ball, rather than crossing. The No.66's attempt goes way off target, though. Milik gets a shot away after a quick turn in the box, but our 'keeper palms his effort away. Liverpool's first shot on goal comes from Wijnaldum, who scuffed his attempt from 20 yards following a speedy counter that was started by Gomez proactively stepping out of defence. Liverpool have been forced into making an early change here, with Jordan Henderson on for the injured Naby Keita. The No.8 went down with nobody around him during a break in play and was stretchered from the field. 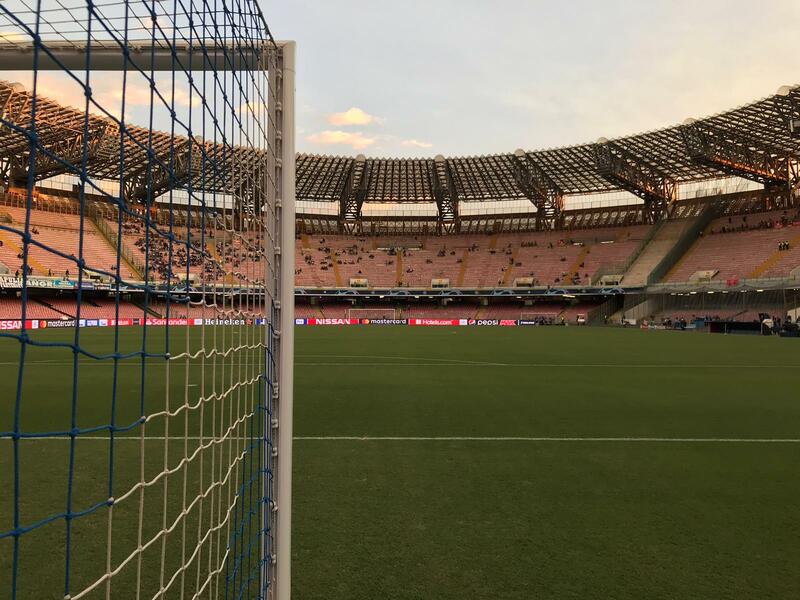 Apologies for the lack of early updates - the wifi connection here at the San Paolo is sporadic to say the least! It's been a fairly even opening 10 minutes. 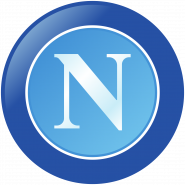 Napoli had the only attempt on goal of note so far a few moments ago, when Insigne's left-footed shot from an angle went narrowly wide. Roberto Firmino tonight continues his record of having played in every @LFC European match under Jurgen Klopp (game no. 30). The boss has explained why his No.8 has got the nod in place of Henderson at Stadio San Paolo. "Fresh legs and the opportunity to do it," Klopp told BT Sport. "Hendo has played a lot of games now and didn't have a perfect pre-season. That's what I decided. I want to have Naby's specific skills in between the lines." 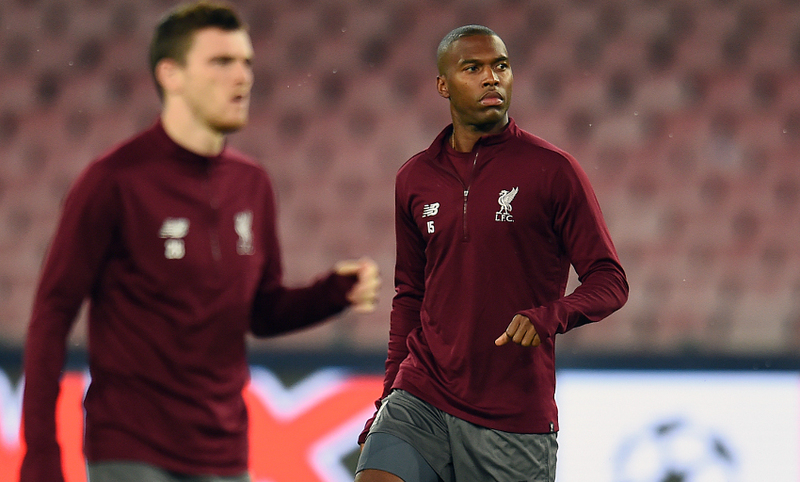 The teamsheet is in and it shows one change for Liverpool as Naby Keita replaces Jordan Henderson for this evening's clash with Napoli in Italy. Where Neymar's early brace has put PSG 2-0 up after 22 minutes. Paris Saint-Germain have kicked off against Red Star Belgrade in France. Here's a reminder of the standings in Group C before the second round of matches. In the other game, Paris Saint-Germain host Red Star Belgrade. 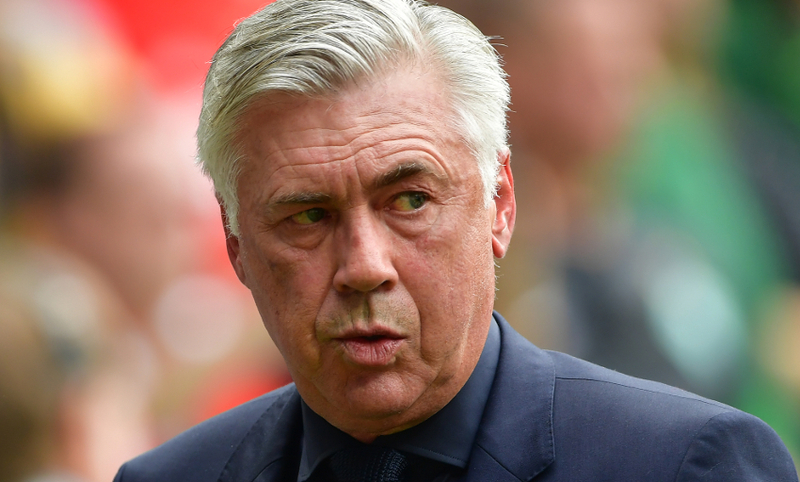 Carlo Ancelotti spoke in glowing terms about Liverpool at his pre-match preview and the Napoli boss explained just what his side will need to do for a positive result in this tie. "Regardless of who plays, what remains the same is our strategy and the mentality of trying to impose our game. We need to keep a balance throughout the game," he said. "I think we have a strong team that's achieving levels of excellence in terms of its play and mentality. At times we're not able to maintain our consistency, but I'm confident because with time we can only improve. That was quite some finish in the UEFA Youth League. 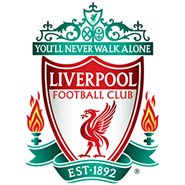 The Reds have been denied a second successive win in the competition by a 94th-minute equaliser shrouded in confusion and controversy. 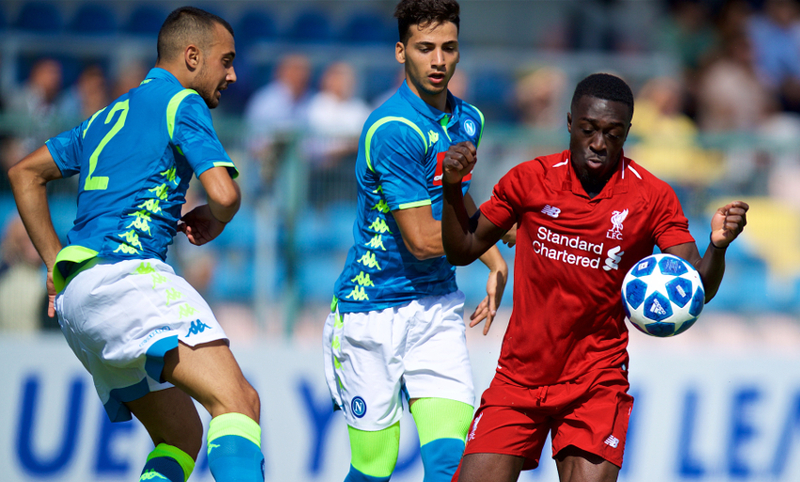 Liverpool U19s lead Napoli after half an hour. Bobby Adekanye got the goal. 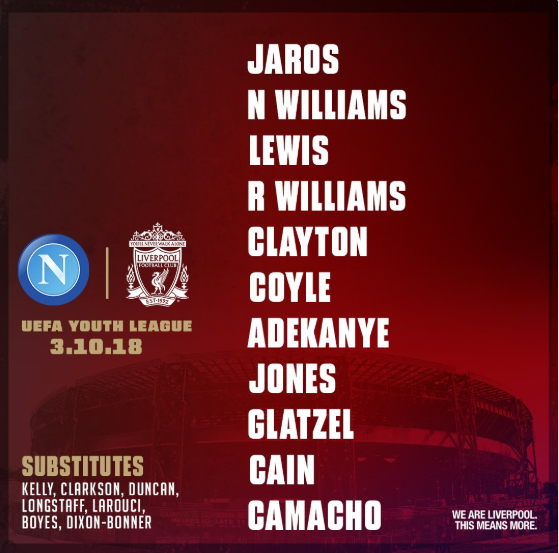 Liverpool's U19s are in action against Napoli in the UEFA Youth League this afternoon. 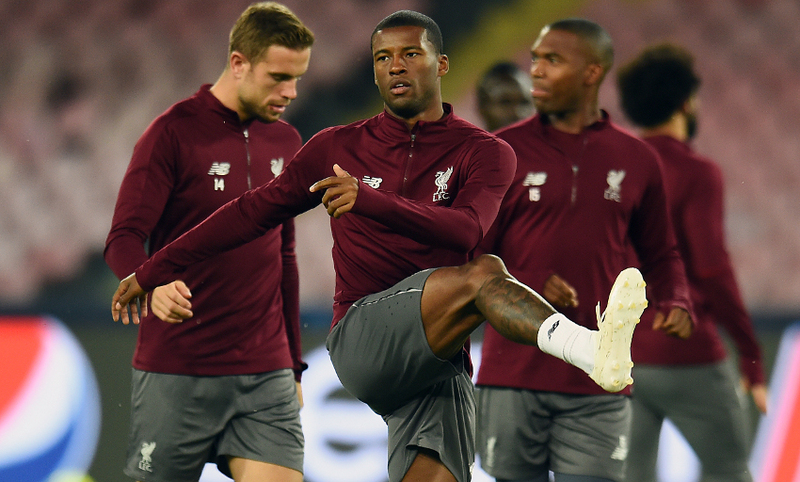 Jürgen Klopp and Georginio Wijnaldum faced the media at the Stadio San Paolo for a pre-match press conference last night, which you can watch below now for free. 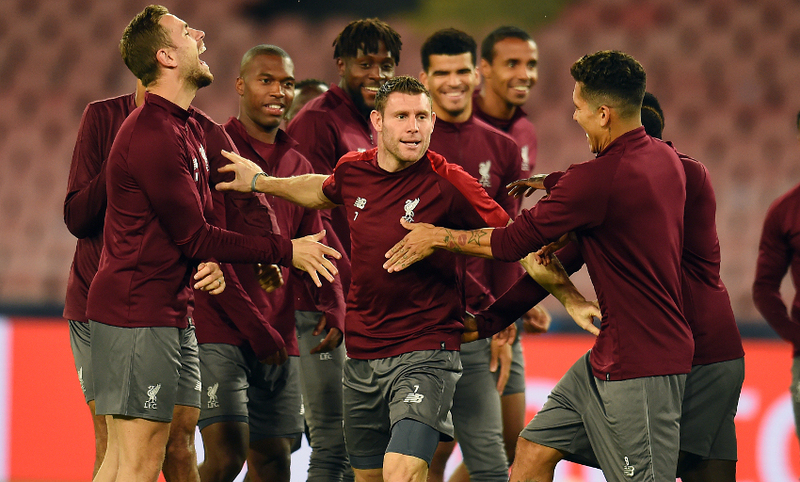 The Reds trained at the Stadio San Paolo last night as they prepared for the clash with Napoli - and we were there to grab the below snaps. Want to know all about our opponents tonight? 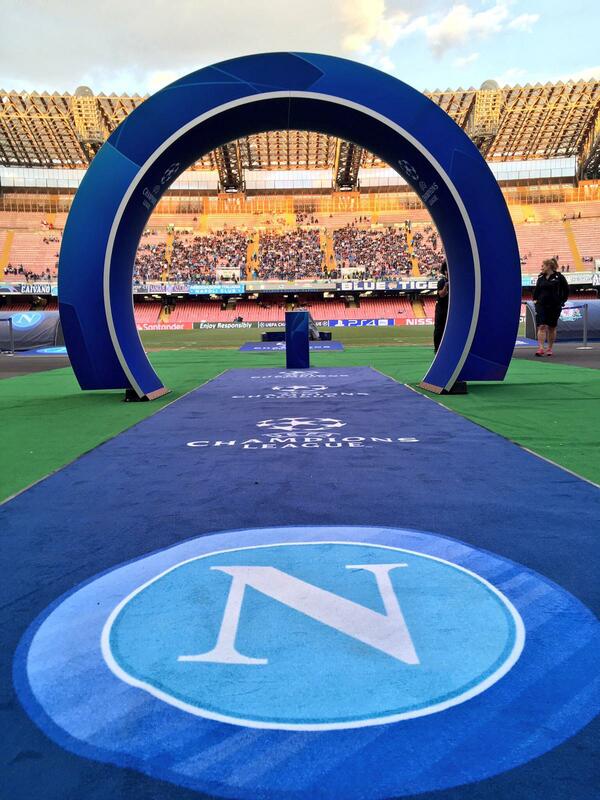 Well, we've put together a comprehensive lowdown on Napoli. Click here to find out all you need to know about Gli Azzurri. Joe Gomez will reach the landmark of 50 games for Liverpool if he figures tonight. Only FC Porto have prevented the Reds from scoring in their last 18 European games - the 0-0 at Anfield last season. Roberto Firmino has played in Liverpool's last 29 European games under Jürgen Klopp. 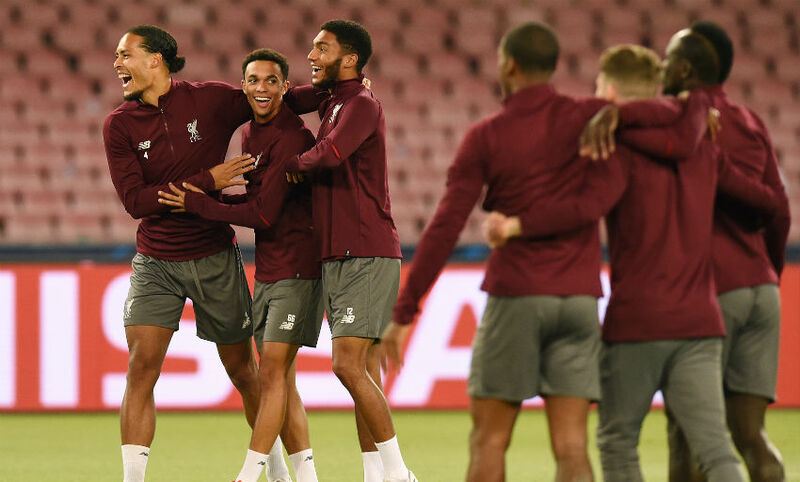 Liverpool have scored 50 goals in their last 16 games in the Champions League, while they have scored at least twice in 10 of the last 12 European matches. 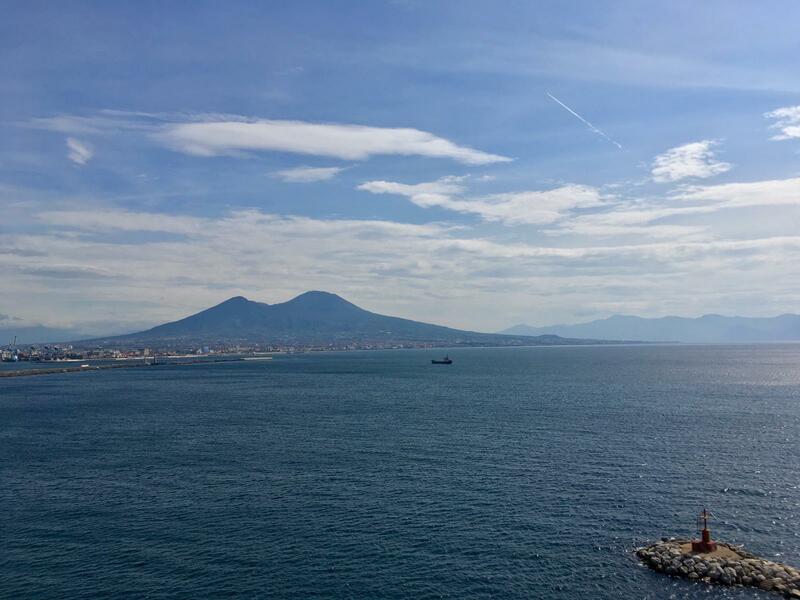 Well, as we've mentioned, it's a sunny morning in Naples, with the temperature sitting at a pleasant 23 degrees. And it's set to stay the same way for most of the day, although it's predicted it may cloud over a little as we approach kick-off. Liverpool fans attending tonight's game should read the following advice. ...his quite frankly ridiculous strike against Chelsea on Saturday was his 50th league goal for Liverpool. You can watch his half-century in full in our YouTube video below. We've got an exclusive extended interview with Daniel Sturridge sitting atop of our homepage today. We sat down with the striker at Anfield last week for an in-depth chat about the current trajectory of his Reds career, in which he provided some genuinely fascinating insight. Grab yourself a coffee and take 15 minutes out to read it in full today by clicking here. 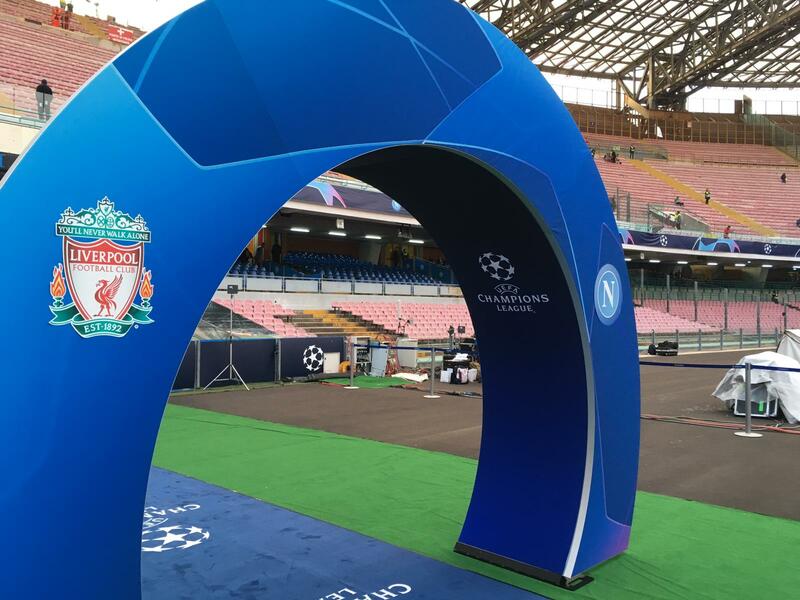 Host broadcaster BT Sport's excellent No Filter series was out in Naples to go behind the scenes of Tuesday night's press conferences. ...from Naples. 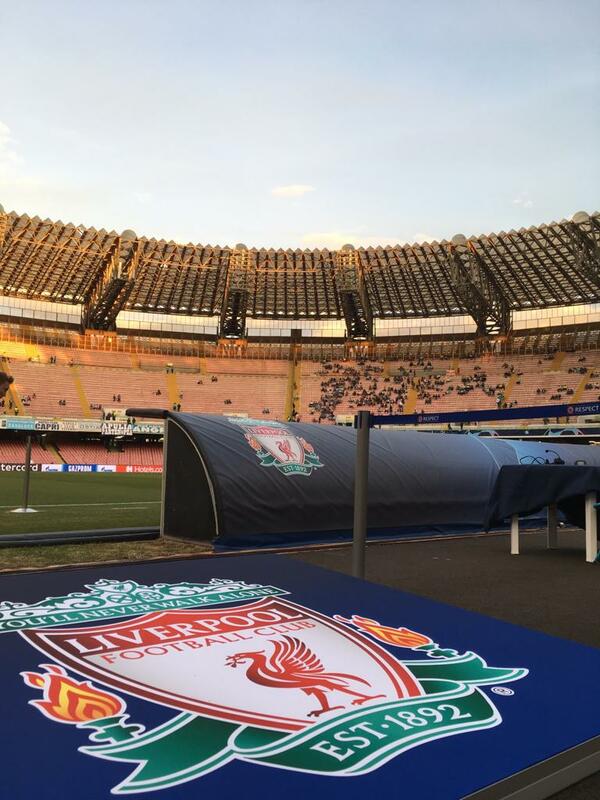 It's a sunny start to the day in Italy as Liverpool get ready to contest thier second Champions League group-stage game of the tournament against Napoli. 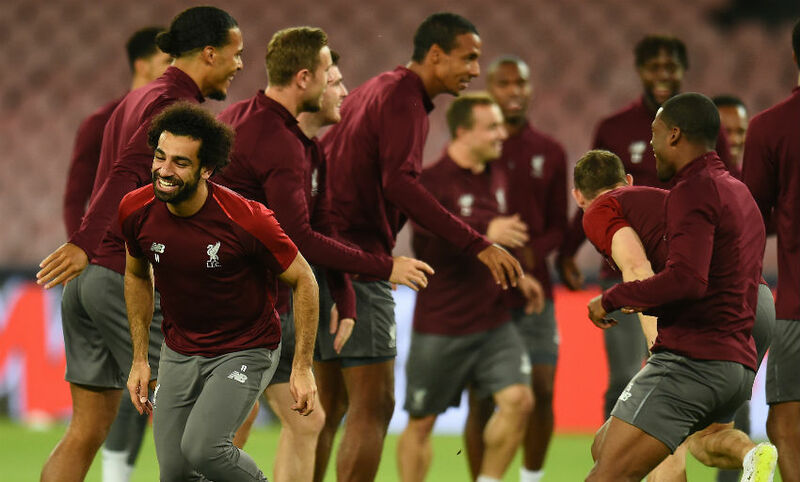 It promises to be quite the atmosphere inside the Stadio San Paolo, with the Reds looking to build on their dramatic 3-2 win over Paris Saint-Germain on matchday one. Stay with us throughout the day as we blog live from Naples and bring you all the match build-up, action, reaction and much more.